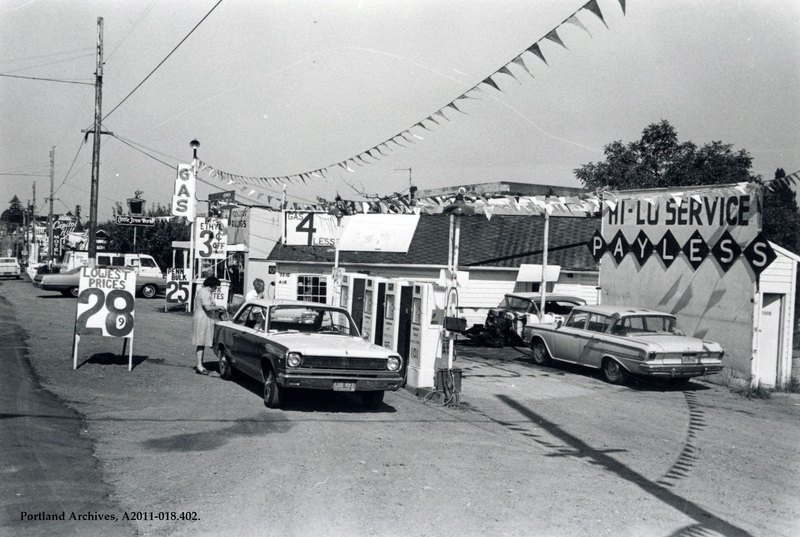 Service station at SW Barbur Boulevard and SW Alice Street, 1969. City of Portland (OR) Archives, A2011-018.402. Something for VP “old timers” I just learned — I’m using a very small iPad to look at the blog today, and when I went to tap the “thumbs up” for igor’s current view, my fat finger hit the “thumbs down” by mistake. However, it let me change to “thumbs up” when I repeatedly tapped that instead! In other words, it took away the mistaken “down” and let me record my “up.”. Hurray! I prefer using Barbour over I-5. Going from Northern Idaho to Arkansas for family visits (notice I carefully avoided using the word vacation) before the Interstates were completed, I loved going through towns on roads very similar to this. Yes, I am an old coot. Barbur Blvd used to have at lot of motels with wonderful neon signs. Today the only thing left is the Capitol Hill Motel and its sign. Barbur Blvd peaked in the 50’s, then I-5 opened. What! No S&H Green Stamps? Edge, you’re right! In the ’50s driving Barbur Blvd. in the evening with all the neon lights and signs was exciting. Now it looks like everywhere else. Robin: The Ara Vista Motel, the Antler Motel, Portland Rose, Capitol Hill Motel, Frontier, Kings Row West, Welcome Motel, Crestwood, Breeze Hill, etc. Good times! To Liz C, in error I have hit a thumbs down a couple of times and have felt such guilt. Thank you for the advice. I’m calling dibs on that Capitol Hill neon it they ever go out of business! I can smell that restroom from here. That old timer at the gas station liked to make signage. Where are the car enthusiasts for this post? Granted these aren’t great specimens, but there’s a Studebaker, and something older behind it undergoing … a bit of work. And yes, the woman with the Plymouth is fishing for a couple of dollar bills to pay for her fill-up. Ha. Dave, I believe the car parked under the PAYLESS sign is an early ’60’s Rambler. Also, another bit of the past is the large numbers on the pumps, in sequence from the left: 92, obscured, 95 and 101. Those were the octane rating numbers, no longer posted in large type. The highest octane rating of pump gas now is 92, the same as the bottom rating then. That was for cheap gas. The Chevron “white pump” gas was about 112 octane. Of course, that came at the expense of our environment – our cars were spewing lead dust out the exhaust pipes from the tetra-ethyl lead used to get those high numbers, but the high performance engines in some cars required high octane. Judy — I’d like to know how you were able to get the red exclamation point into your response. AHH THOSE GOOD OLD DAYS LIFE WAS SO SIMPLE !